Exploding onto the collecting scene, Shohei Ohtani cards have electrified the market to start the 2018 season but that is not a surprise for many who saw it coming even before he joined the Los Angeles Angels. Although it is fair to wonder if the dual threat can maintain his early success on the mound and at the plate, Shohei Ohtani cards are expected to dominate 2018. 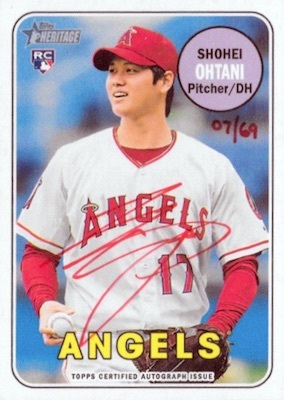 Helped by the big market he plays in and considerable coverage of his move to Major League Baseball, Ohtani's cards started drawing mainstream interest in 2017, but really took off in 2018 with his MLB debut and the many Shohei Ohtani rookie cards. Shop for high-end Shohei Ohtani cards on eBay. Naturally, his signed baseball cards are generally the most popular and valuable of the choices, especially 2018 Bowman Baseball. While they are found in limited numbers, every new set of 2018 baseball cards seems to add to the Ohtani autograph supply. You also can't overlook the early Japanese releases that began in 2013, which supply even more options that pre-date his official MLB rookies. As more cards enter the market, collectors will decide which deserve the most attention. To provide fans with a snapshot of what cards are seeing the most interest online at any given moment, we present the real-time Shohei Ohtani hot list. The list is always updating to supply the most-watched auctions on eBay, and it can be a great way to spot and track the very rare Ohtani cards, or just take note of some crazy prices. The following list includes the most-watched Shohei Ohtani cards currently listed as auctions on eBay. Review the options below and click on specific listings for more information and to place your bid. Follow this link to see the current Shohei Ohtani auctions with the most bids. SHINY SHOHEI OHTANI ROOKIE REFRACTOR 2018 TOPPS CHROME UPDATE #IA-SO INSERT RC! What is the newest 2018 Bowman Chrome Orange Refractor, where Ohtani is the batter, going to be worth? Bowman Chrome is easily the most valuable of the 2018 Ohtani cards. However, the Heritage Gold Refractor is certainly a strong option given there are only five copies. I pulled a legend in the making Ohtani out of a pack of Topps update today and the picture is different from his other LITM card. Anyone else know about this? 2015 Japan Ohtani MEGA RARE 5 BGS 9.5 Auto 9 NOT PRINTED! Autograph "Pre RC"
2013 BBM RE #42A Shohei Otani (Pitching) RC BGS 9.5 Gem MInt All 9.5 Subgrades!